Just over 40% of teens reported having had a few sips of alcohol by the age of 15, but only 16% had consumed a full serve. Of those who had tried alcohol, 28% of boys and 15% of girls had done so before the age of 13. This doesn’t mean that young teenagers who have tried alcohol are necessarily drinking to excess, just that they are sampling alcohol at a relatively young age. For most 14- and 15-year-olds, drinking alcohol was not a regular practice — only 7% had consumed an alcoholic drink in the month before their interview. Parents’ regular, short-term, risky drinking was shown to be a strong factor in influencing their teenage children to try alcohol. Around 11% of mothers and 30% of fathers reported having at least five drinks on a single occasion at least twice a month. Most parents did not drink daily; of those who did, more men than women exceeded guidelines for long-term risk. 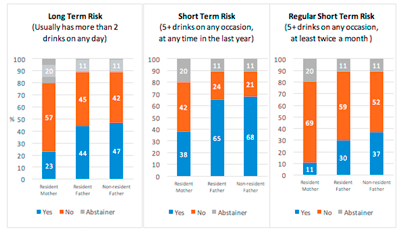 Percentage of parents (of 12–to-13-year-olds) who drink at risky levels. Friends also had a strong influence. Almost 40% of those who had at least one friend who drank alcohol had tried alcohol themselves, compared to only 5% of those who had no friends who drank. The ‘work hard, play hard’ medical student who burns the candle at both ends, consuming prodigious quantities of alcohol before an early morning anatomy class, has long been a staple of university life. But a new survey carried out for the British Medical Journal suggests this stereotype is now little more than a myth. Adolescents who drink alcohol are at increased risk for injury and substance use disorder later in life, even when they do not meet criteria for alcohol use disorder (AUD). This study assessed changes in grey matter volumes over a 10-year period between adolescence and early adulthood in individuals who had alcohol use (as defined by AUDIT-C score), but did not meet criteria for AUD or use other substances. The following areas had smaller grey matter volumes in participants with “heavy” drinking when compared with those with “light” consumption* (control): bilateral subgenual anterior cingulate cortex, right orbitofrontal and frontopolar cortex, right superior temporal gyrus, and the right insular cortex. * Defined by authors as: heavy = AUDIT-C score of ≥4 for males or ≥3 for females; light = AUDIT-C score of ≤2. Comments: This study demonstrates that even levels of alcohol consumption that may be considered benign “experimentation” during adolescence are associated with smaller grey matter in several brain regions. Functional changes in the insular cortex are associated with propensity to return to substance use; disrupted development in this area may be the basis of the association between early initiation and increased risk of AUD in adulthood. The results underscore the risks of adolescent alcohol use and suggest that AUD diagnostic criteria may not be sensitive enough to identify them in this population. Reference: Heikkinen N, Niskanen E, Könönen M, et al. Alcohol consumption during adolescence is associated with reduced grey matter volumes.